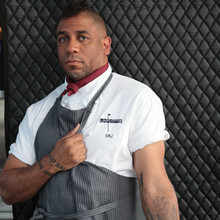 Russell Jackson, executive chef and owner of Lafitte, is not a character who goes unnoticed. With his Mohawk, tattoos, and workmen shirt, Russell is here to make a statement. The polar opposite of a “sell-out chef,” Russell is edgy, outspoken and does not adhere to any established system when it comes to cooking. Maybe that is why he earned the title “the Dissident Chef.” Russell shares his opinions passionately, and sometimes you may not want to hear them. If you piss him off, he’ll probably tell you, but if you speak the truth, you’ll likely earn his respect. There is something refreshing about this directness. Just beneath his hardened exterior is a chef who really does care quite a bit; someone who once you gain his trust, will back you to the end. Lafitte’s large airy patio from designer Roger Wong sits on pricey Embarcadero real estate. The inside echoes a hard, edgy feel, with metal chairs, wooden benches, and high ceilings. Low stools perch at the chef’s counter for a front seat of the action. A long wooden table beckons social diners to relax into a multi-hour meal. The alcohol selection is impressive, with liquors like Pimm’s and Lillet displayed on a high metal shelf. The team is a group of knife-slinging, hard-working desperados who Russell refers to as his “kids,” and who he’ll protect from any disrespect. Russell trains them to be interchangeable. Hierarchy, respect and a chain of command accompany this squad into battle, or the kitchen. “Evolution” is the foundation of Lafitte — it refers to a retooling and revolution. The path forward is sometimes a “controlled chaos.” Lafitte suffered a blow with a negative review from SF Chronicle’s Michael Bauer. What you may not know is that the review was within weeks of Lafitte’s opening. Russell owns that he “let people down in the first couple months.” Yet if “Rome was not built in a day” is it fair to assume Lafitte will be? Russell realizes the rocky start obligates him to build trust back – and each meal is an opportunity to do so. Lafitte’s daily menu is the output of healthy discussion, taking into account the availability of fresh ingredients. Diners choose from two service options: regular tableside or chef’s counter. The latter entails a sense of trust and adventure, and I opted for it. A pescetarian friend joined me and Russell adapted quickly to her profile. To prepare our palates, the sommelier suggested a modern take on the popular Kir royal, using cranberry liquor from Clear Creek Distillery in place of cassis. The aperitif was bright and aromatic, with hints of cranberry. Our journey started off with foie gras de torchon over a splash of marmalade gelée, complimented with house-pickled lychee and a touch of micro greens. 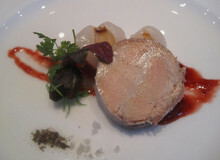 The marmalade’s tangy mustard quality broke up the luxurious texture of the foie. My friend’s dish mirrored mine in appearance but in place of the foie was a crisp slice of Armenian cucumber. 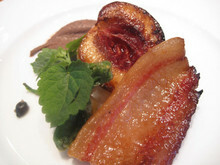 My next dish featured semi-precious Iberico ham. It is almost as hard to import this Spanish meat as it is contraband, but Russell located the vendor who could do it. A bed of black chickpea hummus dressed my plate, with slices of sweet grilled nectarines layered on top. Lightly fried padrón peppers provided spicy grit, and thick Iberico bacon elicited stomach growls. The bacon glistened with fat, and I was all over it. My friend’s option paired padrón peppers with cheese-stuffed fried squash blossom. Make sure to get every last drop of the shallot and nectarine vinaigrette with zesty orange oil. Our third course included my favorite crustacean — diver scallop. The perfectly tender scallop was crusted with brown butter then topped with a long onion. Lemon butter aioli, golden balsamic, and marjoram showered the plate. The marjoram’s strong, earthy taste accompanied the dish from start to finish. I enjoyed the boldness but those preferring more balance may feel a bit overwhelmed. The next round was a seasonal spin on pesto. Russell’s team twirled simple capellini with roasted nettle puree, and finished it off with a sprinkle of sweet cherry tomatoes. The bright green nettles provided a nutty heartiness. The uni beurre blanc sauce on the fifth dish was positively sinful. Soft lima beans dusted the plate, and perfectly seared Tombo tuna with wasabi zest stood out as the main spectacle. Diners will want to make love to this sultry and soulful dish. For the pescetarian offering, Russell showcased Spanish Manchego cheese cooked sous vide style, served with squash and thin dehydrated carrots. My dish of pepper-crusted medium rare prime rib reinvigorated carnivorous tendencies. Accompanied by wax beans, fingerling potatoes, and an herbaceous “lion’s mane” sauce, the plate roared with flavor. Diners will want to save room for dessert. Our selection included moist, fragrant vermouth grape cake, strawberry-rose pot de crème with fresh elderberries, peach pie with vanilla bean sauce, and chocolate chip cookies with flecks of crispy bacon. Self-control was not an option. Russell is embracing a revolution for Lafitte’s menu. He is cryptic about details but during my four-hour meal, I experienced a preview. Lafitte is moving towards multi-course meals matched to dynamic taste profiles. Freedom of choice and adaptability may be the crux of what is to come to Lafitte; and I’m ready to participate with napkin, fork, knife, and appetite.